GH3EQ-1208 | Size: 200 ml / 6.8 fl. oz. 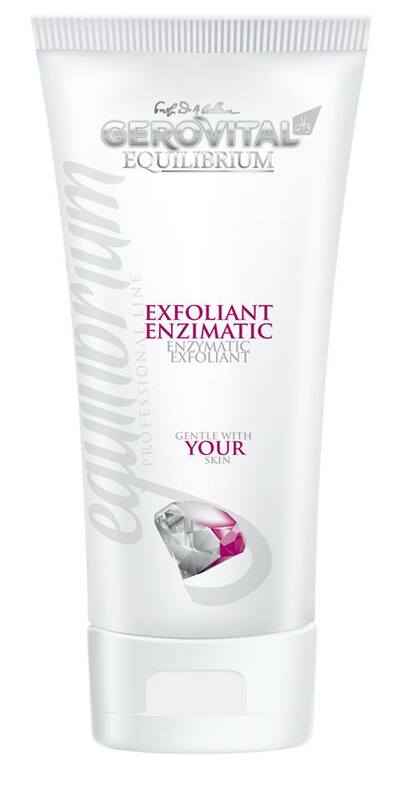 Enzymatic (biological) peeling is considered to be the next-generation exfoliations. It deeply cleanses and rebuilds the skin causing no harm at all on healthy tissue. The Gerovital H3 Equilibrium Enzymatic Exfoliant uses proteolytic enzymes to polish away dull dry skin, revealing a smoother more radiant complexion. Proteolytic enzymes are the most scientifically sensible and effective method to accomplish a non-invasive exfoliation. Regular usage improves the skin tone and smoothness, softens the appearance of fine lines and wrinkles, reduces pores, boosts skin’s moisture. It also helps hyperkeratosis affected complexions by dissolving the thickening of the stratum corneum (the outermost layer of the epidermis). Smart resurfacing, anti-inflammatory, moisturizing and nourishing ingredients are gentle with your skin and can be used on all skin types that have no signs of lesions. Papain, a proteolytic enzyme derived from the papaya fruit is very effective in skin renewal and skin lightening. It destroys the keratin of dead cells and the debris, allowing the skin to breathe and feel more alive and vibrant. It also functions as an exfoliator, skin softener and moisturizer and helps fight acne. Helps combat free radicals, thus preventing premature ageing. Micro-capsulated technology protects the papain enzyme, its action being released during the facial massage. A blend of natural oils and fats (Wheat-germ oil, Almond oil, Shea butter), optimizes its hydro-lipid barrier function of the skin, locks in moisture and provides deep skin rejuvenation. Vitamins A and E are powerful and effective natural antioxidants which help protect cells from free radicals oxidative damages and the destructive processes caused by them. Boswellia Serrata Extract, an extract from the gum resin of a tree and also a source of Indian frankincense, minimizes the risk of irritated skin, tames occasional redness bringing a calming and anti-irritant effect, helps skin to appear smoother and softer. Usage: Once a week or in the Peeling / Gommage phase of the cosmetic treatment. Apply on the clean face neck and décolletage, avoiding the eye area. Massage in a circular motion with gentle pressure to activate the papain micro-capsules. Once applied, leave it up to 10 minutes than remove with warm water. Follow with a serum or an emollient moisturizer. At the end of cosmetic treatment, it’s recommended to apply a sunscreen with medium protection factor (or higher). It is not recommended to be applied during summer or before sun exposure, in order to avoid the appearance of pigmentation spots due to strong sunlight. Apply on the clean face neck and décolletage, avoiding the eye area. Massage in a circular motion with gentle pressure to activate the papain micro-capsules. Once applied, leave it up to 10 minutes than remove with warm water. INGREDIENTS: AQUA, CAPRYLIC / CAPRIC TRIGLYCERIDE, SUCROSE POLYSTEARATE, HYDROGENATED POLYISOBUTENE, CETEARYL GLUCOSIDE, CETEARYL ALCOHOL, GLYCERYL STEARATE, GLYCERYL STEARATE, TRITICUM VULGARE GERM OIL, PRUNUS AMYGDALUS DULCIS (SWEET ALMOND) OIL, GLYCERIN, XANTHAN GUM, PHENOXYETHANOL, CAPRYLYL GLYCOL, PECTIN, HYDROLYZED VEGETABLE PROTEIN, SERINE, ARGININE, PROLINE, GLUCOSE, CARRAGEENAN (CHONDRUS CRISPUS), BUTYLENE GLYCOL, ETHYLHEXYLGLYCERIN, ETHYLHEXYL COCOATE, SORBITAN TRISTEARATE, C24-28 ALKYL DIMETHICONE, PROPANEDIOL, SCLEROTIUM GUM, AGAR, MALTODEXTRIN, PAPAIN, POLYACRYLAMIDE, C13-14 ISOPARAFFIN, LAURETH-7, DIPROPYLENE GLYCOL, BOSWELLIA SERRATA RESIN EXTRACT, BUTYROSPERMUM PARKII BUTTER, DIMETHICONE, METHYLPARABEN, ETHYLPARABEN, PROPYLPARABEN, BUTYLPARABEN, TOCOPHERYL ACETATE, RETINYL PALMITATE, HELIANTHUS ANNUUS (SUNFLOWER) SEED OIL, BHT, PARFUM, TETRASODIUM EDTA, SODIUM HYDROXIDE, BHA. SUPEROXIDE DISMUTASE, PENTYLENE GLYCOL, TROMETHAMINE.